Calli-San Clinton and Alicia McCormick decided that they couldn’t leave Rosie alone and spent three months tirelessly trying to win her affection. Rosie lived alone for most of her life in Neraabup National Park (Western Australia). She had been seen living in the bush, but no one had taken the time to rescue her until Calli and Alica decided to help her. "We spent hours watching and waiting for her to appear. We left a food on a towel for her to find, we called out to her when she appeared but she was so scary" says Calli. They left a food station and she started to come and eat everyday. "Rosie began waiting for us when we called her, she start learning her name, we left treats on the towel and we moved closer everyday" says Calli. 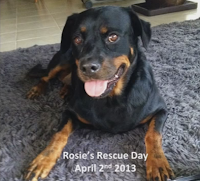 After living in the bush for most of her life Rosie started to become friendly and finally left the bush.